My daughter just turned six. 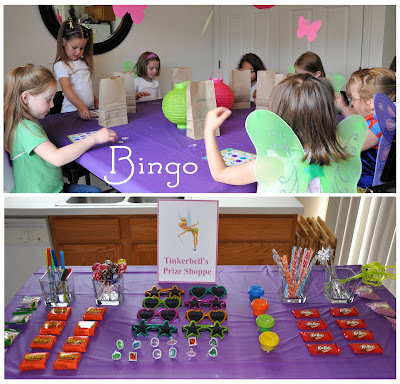 To celebrate we had a Tinkerbell party. I had so much fun preparing for this party. For the place settings I created Tinkerbell place cards in paint shop pro, placed a wand on each plate, and tied a ribbon around the handle of the cups and hot glued a silk flower to the ribbon. When the girls arrived I gave them fairy make overs. I dusted their cheeks with fairy dust (body glitter), let them pick out a set of sticker ear rings, gave them a Tinkerbell ring, painted their fingernails with glittery nail polish, and gave them a set of fairy wings if they didn't already have some. They all LOVED this. 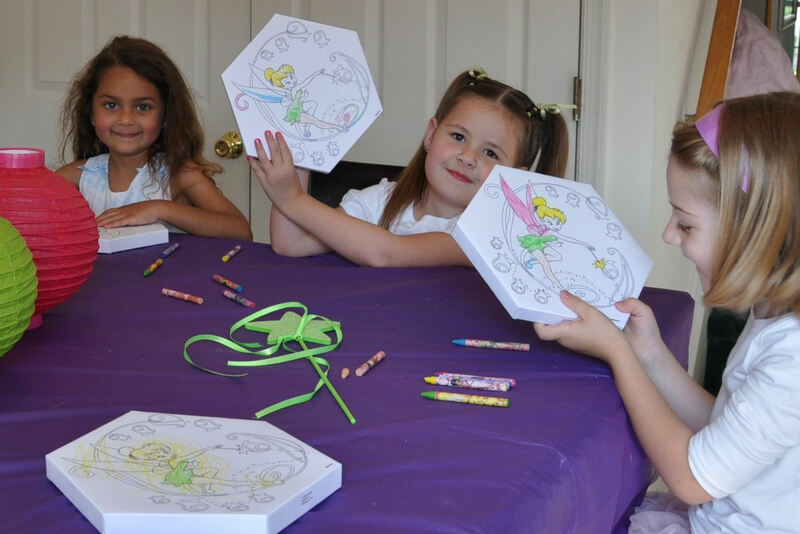 After they were turned into a fairy I had them color a canvas picture of Tinkerbell while they were waiting for the other guests to arrive. I found the canvas picture/crayon sets at Michael's for $1 a set. We served pizza for dinner. After pizza we handed out Tinkerbell ribbon batons and took the girls on a walk to try them out. These were a big hit! They all LOVED them. I set up a Tinkerbell prize shoppe and we played bingo for one of the games. I found some brown Tinkerbell paper bags at the Dollar Tree. I wrote their names on the bags and let them use them to collect their prizes in. We also had to play Fairy, Fairy, Tinkerbell aka Duck, Duck, Goose because it is my daughter's favorite game. We made edible fairy wands out of pretzel sticks, vanilla flavored candiquick, and sprinkles. After the candy coating dried I wrapped them in individual pretzel bags and tied them with a glittery ribbon. I forgot to take a picture of the cake before the party. It was a flower with Tinkerbell on top. I also bought some cupcakes with flower rings. After the cake and ice cream we opened the presents. My daughter wanted a sleepover so we made that part optional. A few of the girls stayed to sleepover. My husband put on some music and the girls had a dance party. We ended the night with a Tinkerbell movie. For breakfast I bought mini boxes of cereal, packages of mini donuts, and I made these butterfly waffles. I bought these bags on clearance after Halloween. I put their wands, ribbon batons, bingo prize bags, and edible fairy wands in these bags for them to take home.